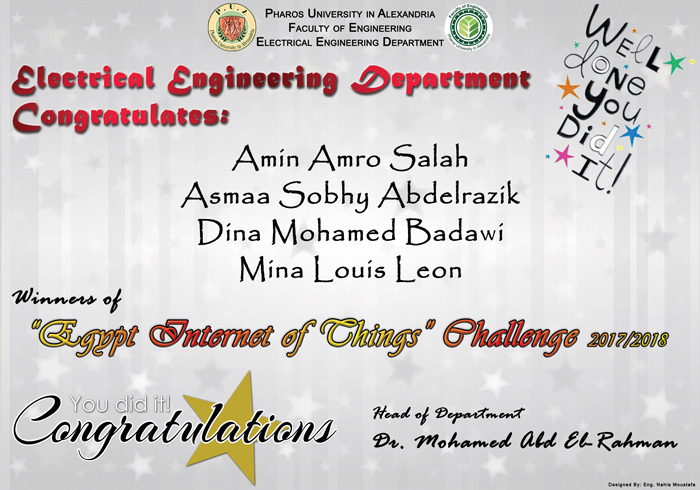 The Electrical Engineering Department students won at Egypt’s Internet of Things Challenge that was launched by the Academy of Scientific Research and Technology on Thursday 13/7/2017. Only 50 projects, out of total 111 projects submitted from all the Egyptian governorates, won the Academy prize which offered the students both financial and emotional support to finance and complete their graduation projects. 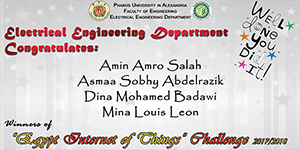 The students’ projects and researches were conducted under the supervision of Prof. Mohamed Abdel Rahman and Dr. Mohamed Abdel Kareem.